Impress your readers or clients with Coverbind Standard Ambassador thermal binding covers. This hard case cover is leather bound with a rich texture. The cover is a sturdy 1/10" thick cardboard with the inner lining matching the outside cover. Available in navy blue and black, you can hold anywhere from 10 to 240 pages in their six different sizes. The special adhesive in the fabric spine of these covers ensures you're documents will stay safely bound. If you're looking for a professional, clean look that will keep your papers secure, these covers are for you. Welcome to MyBinding video. 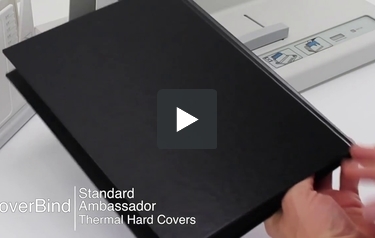 Let’s have a look at CoverBind’s Standard Ambassador Thermal Hard Covers. These are an ideal solution for binding your most important reports, presentations, manuals or proposals. The adhesive is built right into the spine so all the work is done for you. The attractive leather-like finish is professional and elegant. All you need do is take your inside, put it into the outside, tamp everything down so it’s nice, flush and square. Place it in whatever thermal binding system you’re going to use. These work great with all the CoverBind machines, remove it at the appropriate time, let it cure and you’re on your way to a fantastic looking book made in just minutes. These hard covers use an EVA glue with embedded book fabric to ensure the strongest possible bond so your pages won’t fall out. There it is, the standard Ambassador Hard Cover. For more demos, reviews and how to’s, check out MyBinding.com.